At the beginning of this year I decided that I wanted to make a change to how I handled my personal storage. I had a custom built PC that has 2 x 500Gb hard drives in a RAID 1 configuration as well as a 750Gb additional drive to store photos, videos, and other large data files. I also shared this data to other computers on my home network. I decided that I wanted to make a change to my configuration and accomplish a few things. I was becoming afraid of not having redundancy with my 750Gb drive so I decided that I wanted to upgrade to another RAID 1 configuration for this data. But I didn’t want this to be done inside my main computer, I wanted to go external. Lastly I wanted the data to be shared across this external drive to my network and not dependant on my personal machine being on. The solution was to find an external 2 bay NAS. Once I made that decision I began my research. Buying a NAS is somewhat of a tricky affair as there isn’t as many resources available as with other major electronic products. Also, there are many companies with offerings that I had never heard of. After spending tons of time Googling my way across many websites and resources I finally landed at the NAS section of SmallNetBuilder.com which offered the best information. What made the site so great was that they offered a custom filtered charts area where I could plug in the requirements of what I was looking for and view products returned that they had reviewed and rated. One of the most important factors for me was the network speed of the device. Other things I was looking for was BYOD (provide my own hard drives) RAID, Gigabit LAN, FTP, UpNP and a reasonable price. drives which is what I bought. When I got all the hardware I arranged it nicely for the unboxing shot you see below and then immediately dropped the drives into the enclosure. It was easier than snapping together two Lego blocks. 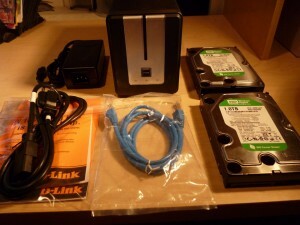 I then powered it on and followed the directions to setup my 2 x 1TB drives in a RAID 1 configuration. The setup is done through a great simple interface using your browser that is very similar to managing a router. That went smooth and then it was time to backup the 750Gb drive in my machine to this new NAS. Sure enough the speed ratings were true and I was happy with how quickly the process went considering it was happening over LAN and not USB or external SATA. After I copied the data over I was able to remove the 750GB drive from my local machine which I was happy to do which provided less power, noise and heat now from my main machine. Speaking of which there is a nice setting for the NAS which allows the 2 drives to go into hibernation mode which you can configure from the menu. So I continue to navigate and learn all of the features and menu system. Some of the other features offered by the D-Link 323 that I didn’t mention before are that it also can be an iTunes server, DHCP server, Bittorrent server, and offers Dynamic DNS support. 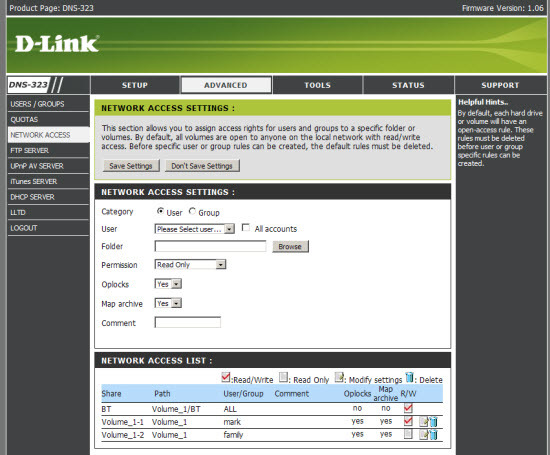 You can also control access to the device by users and groups along with defining quotas. It’s a very feature rich device. And if you still are yearning for more there is a hack you can do to get even deeper root access with even more features with mods from here. I really like the interface to control the device. It’s very clean and simple and offers tons of features. One of the only issues I had with the unit was with the iTunes server. I didn’t plan on using it, but ended up enabling it to see how it worked. I ended up not needing it but after having enabled it I noticed that my drives didn’t seem to want to hibernate anymore. The only way to fix this was to disable to the iTunes server. Not a biggie for me, but maybe for you. Also, I’m not sure if that was just my setup or a bug in the firmware but worth investigating if that’s important to you. I was able to successfully get the UpNP running and recognized by my PS3 and in turn was able to stream all media from the D-Link 323 to it. So in conclusion I am very happy with the D-Link 323. It was great to be able to purchase such a feature rich and high performance NAS that came highly recommended even though it was the least expensive one available. 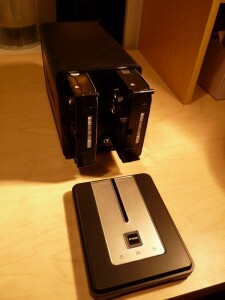 If you are looking for an external enclosure that you can tuck away in the closet next to your router, get redundancy so you don’t worry about losing data, and getting great speed over your lan, than this is the NAS for you. Hi i was wondering how much you would to set your design up on my web blog for me, because i truly like the look of your site but i do not know how to create such a hot graphic. Hi i have wondered how much you would bill to set your blog theme up on my internet site for me, because i truly like the look of your weblog but i do not know how to set such a well looking design. Heya! Excellent thought, but could this genuinely work?